God Is Warning, His Watchmen Are Warning, As Chaos Spreads In The World Are You Ready? – I Am Not Ashamed Of The Gospel Of Christ! Home › views › Commentary by CJ › God Is Warning, His Watchmen Are Warning, As Chaos Spreads In The World Are You Ready? God Is Warning, His Watchmen Are Warning, As Chaos Spreads In The World Are You Ready? Recently I’ve listened to several audio books about possible scenario’s for the fall of America, such as 1 second after, Patriots, A last Babylon. The latter is ongoing. But one thing that stuck out in my mind with these is a common thread that when America falls of course millions die, but what remains is very few Christians who cling to their faith. In these there is a great panic and fear that cause people to turn to man and alternative governments rather than holding to their faith in God. There are a few, very few in these scenario’s who do, and they fair well in the chaos. Now this is what keeps me awake at night. Ready for a Police State? The western Christian view is that the scriptures tell us that we are not appointed to God’s wrath and there will be a ‘secret’ rapture and another exodus not told in Scripture to rescue us out of the ensuing tribulation. But the Bible even warns us that before the man of sin, before our being gathered together with Christ, comes great tribulation as has never been seen, nor ever will be again. Look what is happening in Syria, Libya, and most recently the Ukraine. Man’s governments are butting heads, clamoring for control. You think what is happening in Ukraine can’t happen here? Now I think we can all agree that the world is sliding into perdition at a rate unprecedented. Homosexuality and sexual sin is rampant and growing like a disease in a pietree dish. Especially in America and the west. There are wars & rumors of wars growing in number. God is pushed away, idols and yes even satan and foreign god’s are being worshiped on our shores. We can all agree that America is on a downhill slide in every aspect; morally, economically and even politically. That will cause chaos and conflict like never before seen. I don’t want to speculate or debate what is the catalyst that causes this, just know it is close. But how many will not be prepared. How many will enter this thinking they will be whisked away untouched. These same souls will be the first to fall away as Paul warned. They will toss their Bible, because they will think it was false, it was full of errors, and will fall away from the true gospel to follow a watered down version of man’s doctrine that places man at the head of salvation. Just as these books portray. Or when the true false christ (antichrist) appears they will follow him blindly. The very first thing this false christ will do is announce that the Bible wasn’t exactly right. That man lied, and will deny that Jesus is God’s son, only a prophet, and he is here to tell us the truth. In the middle of all this chaos people will flock to this man made or satan made version of christ by the thousands. And with technology increasing the way it has, they will be the only ones with power and will put on quite the show. All of a sudden everywhere, TV sets that are silent will be alive with holograms of the real christ (antichrist) and will allow the whole world to view his rise. It’s not that far fetched, it’s in the Bible, John say’s that the dragon even gave power to the image to speak. If you’ve ever witnessed a holgram, it’s rather strange, alarming, and spine-chilling to witness. Remember this Michael Bolton Commercial from Honda for the Holidays this last Christmas? 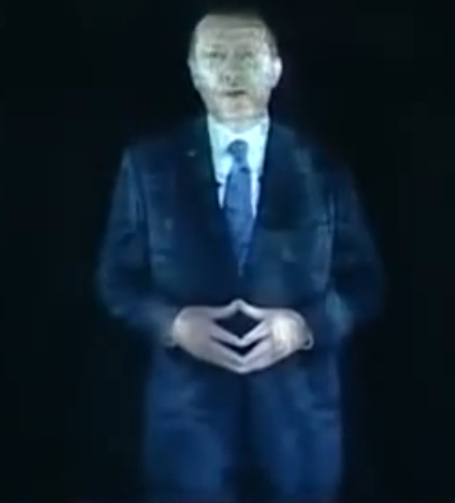 How about this one that Erdogan used to talk to his cabinet recently. So see how easy it is to portray? See how easy it will be to make the image speak? 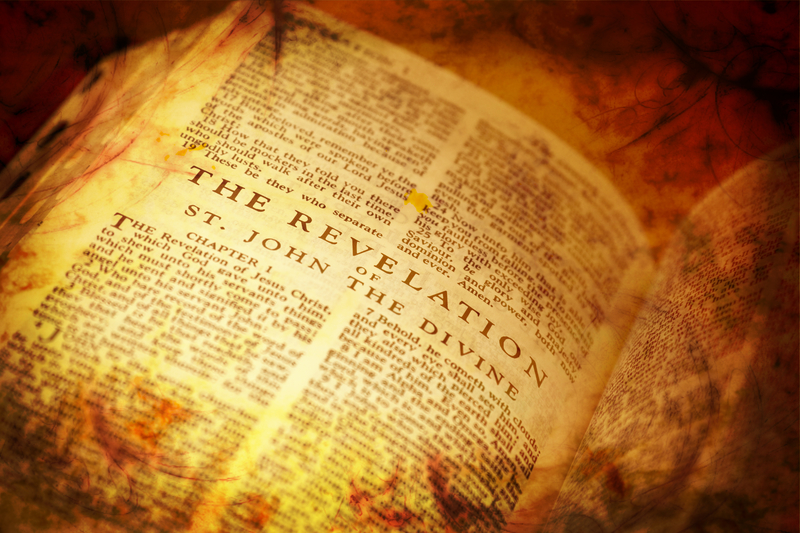 (Revelation 13) So regardless of what you have been taught or believe, dig into the scriptures to see what tribulation is coming, search your heart, spend time getting closer to God, and Jesus. Get to know His voice. While your preparing for food and water shortages, prepare for a shortage of the word, memorize verses, verses you will need to give you encouragement, win the lost, keep your faith. Over and over we hear stories from the Holocaust during WW2 like Corrie TenBoom for instance. She said she had memeorized verses from the Bible, and this kept her through her tribulation in the concentration camps. Memorize, and get to know the Bible and God’s word. Learn how to feel the Holy Spirit’s presence. Learn how to rely on this for your guidance even daily guidance. Please prepare. No matter what you believe at least prepare. Even Dietrich Bonhoeffer continued his work in prison, winning even the guards. For a year and a half, Bonhoeffer was imprisoned at Tegel military prison awaiting trial. There he continued his work in religious outreach among his fellow prisoners and guards. Sympathetic guards helped smuggle his letters out of prison to Eberhard Bethge and others, and these uncensored letters were posthumously published in Letters and Papers from Prison. A guard named Corporal Knobloch even offered to help him escape from the prison and “disappear” with him, and plans were made for that end. 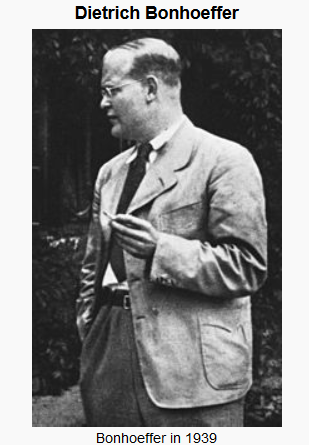 But Bonhoeffer declined it fearing Nazi retribution on his family, especially his brother Klaus and brother-in-law Hans von Dohnanyi who were also imprisoned. Are you ready to cling to your faith as the Apostles and other’s have done, even unto death? Are you ready to stand firm and stand for Christ, even unto death? Jesus said ” But whosoever shall deny me before men, him will I also deny before my Father which is in heaven.” Are you ready to take up your cross and follow Christ, or will you follow the image of christ (antichrist)? Prepare, and choose wisely, your eternity depends on it. Don’t let the examples of Christ, the Apostles and those who followed like Polycarp, and Bonhoeffer go unheeded. So many are now today being killed for their refusal to denounce Christ and convert to another doctrine. Prepare, read the warnings in God’s word, don’t take my word for it. God will see us through this and if we are overcomers we will be rewarded. Praying for all of those watching, and the lost so they may turn. Praying for those dying for their faith right now. Praying for those persecuted for their faith right now. Mike I have read all that you have posted on FB & I believe you. I think the country is going down morally and ethically and that Satan is everywhere and there are fewer and fewer followers of Christ every day. Jesus Christ died and rose again so that we might live through our faith and belief in His shed blood. We need to witness daily to win others to Christ and to help the lost souls find Him before it is everlasting too late. I also believe that it is the prophecies in the Bible being fulfilled every day. I pray for you and your family and I ask that you also pray for me and mine especially those that do not know Christ. Hi Patricia, I’m not Mike and I really don’t know a Mike, but I believe you are right. There are fewer and fewer followers of Christ everyday. And it is time to witness daily to win others and help the lost. The harvest is near and the workers are few. Praying for all who are lost and the followers of Christ to be strengthened. Thanks for visiting. These are the final events that precedes abomination of desolation.Let us pray for the latter rain so that we may stand firm during the great tribulation. How sad man has to always fight,but it is the patience of the saints that will prevail as God himself protects us through the great tribulation. I t is well worth it all to inherit eternity. Just as Christ suffered then entered heaven….we must do the same. God Bless all my brothers and sister in Christ. Thank you sister! You too! AMEN! VERY GOOD AND TIMELY. LET US ALL PREPARE OUR HEARTS. PEACE+ BE WITH YOU SISTER. I know of some who believe God will keep us IN THE MIDST OF THE TRIBULATION, not that we will be ‘raptured’ away, but we will be strong and hide under the shadow of God while all this is going on. I’m definitely working on memorizing scriptures! Yes, and that’s where our hope lies. In the arms of God with His word engraved in our minds and hearts. Thank you, and may God keep you in His hands.